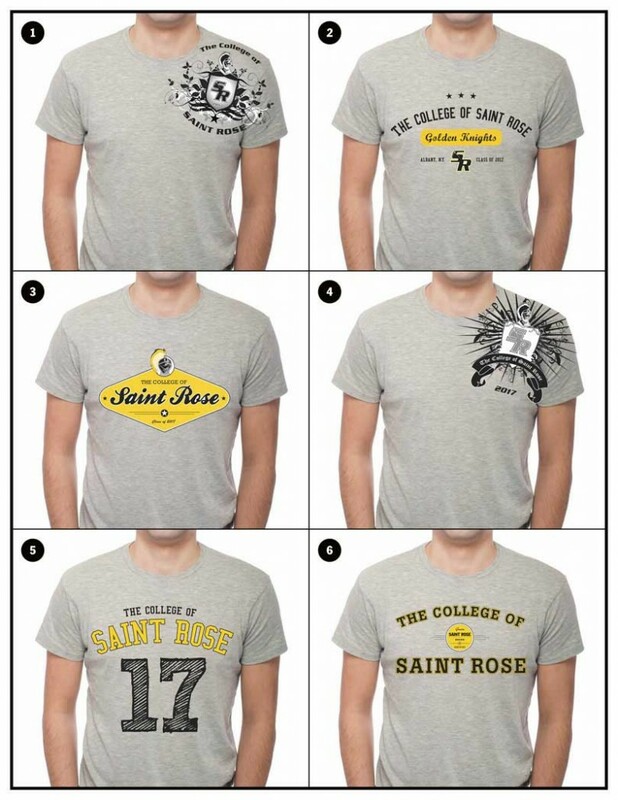 Saint Rose Class of 2017- it’s time to vote for your t-shirt! Up to this point you’ve gotten formal letters congratulating you on your acceptance. Perhaps you’ve attended an accepted student reception or have received an invitation for our upcoming accepted student days. This is a very exciting time and we are thrilled to be welcoming you to The College of Saint Rose. Now, this is college after all, so let’s take a moment to have a little fun~ it’s time for you to pick your Class of 2017 t-shirt! This is the second year we have offered the incoming class the opportunity to select its own t-shirt design. We have retired the Class of 2016 design, and when the Class of 2017 selects it’s shirt, that design will be exclusive to that class as well. The shirt will only be given out at summer orientation, meaning no, you can’t grab your own at the campus bookstore. “Okay, okay, I get it. How do I vote?” It’s easy! Follow this link to launch our survey. Select the t-shirt design you like the most, vote for it, and click “done.” Voting is open TODAY through June 1 and the design with the most votes will win. We will then announce the winning design at the first summer orientation on June 25. ← Social Justice Week 2013!!! I like number 4, but it would be great if there was little yellow on it.